It's hard to believe how much the COOLPIX S3700 offers—high resolution photos and HD videos, plenty of zoom, fun features and even connectivity! Share exceptional images from the COOLPIX S3700 to a compatible smartphone wirelessly—in a snap, using built-in Wi-Fi® and Near Field Communication technology (NFC). 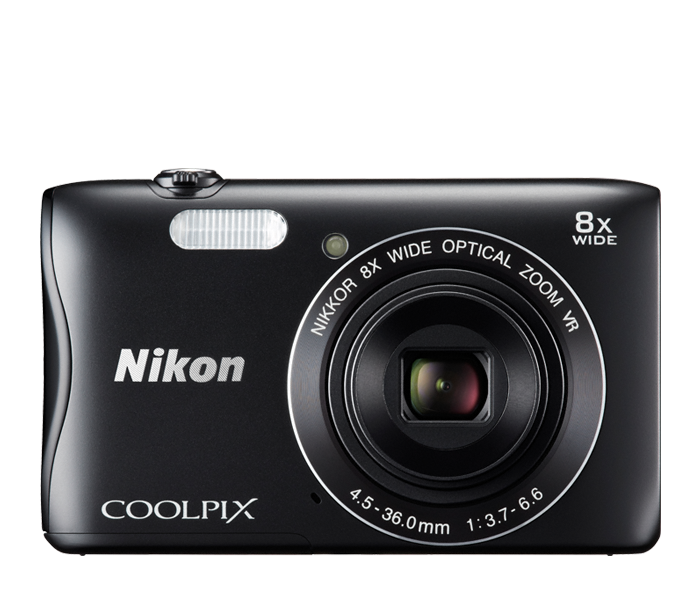 ** Pull the COOLPIX S3700 out of a pocket or purse, zoom in and capture a special moment as a great 20-megapixel photo. Then use your smartphone to quickly post the photo online or text it to your friends. Enjoy outstanding memories and plenty of "likes" with the COOLPIX S3700. Every COOLPIX is designed around a genuine NIKKOR glass lens, the legendary optics that have helped make Nikon famous. The COOLPIX S3700’s 8x optical zoom lens goes from wide-angle—great for portraits and landscapes—all the way up to telephoto—great for closeups of sports, concerts, nature and more. When you need even more reach, zoom up to 8x with optical zoom and 16x with Dynamic Fine Zoom, an enhanced digital zoom function that effectively doubles your reach. Quickly and easily send photos wirelessly from your Wi-Fi & NFC enabled COOLPIX S3700 to a compatible smartphone or tablet±. Share your great photos on the go, even in remote locations, or use a smartphone or tablet to control your camera. Experienced photographers optimize their camera settings to match the situation. The COOLPIX S3700 does that work for you. With 16 Scene Modes, including Beach, Snow, Night Portrait, Sunset and more, it's easy to match the moment to a Scene Mode. You can even get creative and use Scene Modes to alter ordinary shots. Or, select Scene Auto Selector and let the camera choose the best mode for your situation. Have fun with your shots! Turn everything black and white except a red hat with Selective Color. Give a scene an antique look with Nostalgic Sepia. Image Effects makes it easy to create exciting images without any additional software. It's frustrating when a smartphone camera focuses on the wrong thing. With COOLPIX S3700, Target Finding AF quickly determines your intended subject and puts the focus where it belongs—on your subject. With minimal buttons and dials, a large high-resolution LCD display and excellent build quality, the COOLPIX S3700is a highly portable performer.